Dollar Hegemony – Real or Sophistry? QUESTION: Mr. Armstrong; I really wish I found you sooner. A friend of mine has been telling me to listen. He bought the Dow at 17,000 and sold it 26,000 on your advice. He paid off his house and has told me – see, I told you so. I get these emails from the gold community who seem to never give up on every day will be the start of a new rally. This latest one also paints the United States as “dollar hegemony” and they claim that the US expanded greatly following the fall of the Soviet Union. They say China has woken up making money on trade with America. They now say the dollar will collapse and China will be the new world order so buy gold and sell the dollar. These people seem to have no morals. They sleep perfectly fine raking in the money from people like me robbing us of our savings and preventing us from participating in the real economy as we should. Is there any real dollar hegemony or is this also just hot air? ANSWER: No, it is total nonsense and you are correct – it is designed to rob people of their life savings. There is no “dollar hegemony” for that assumes that the USA is somehow imposing the dollar upon the entire world by sheer will. History shows that the USA has pursued a policy of lowering the value of the dollar for trade purposes. 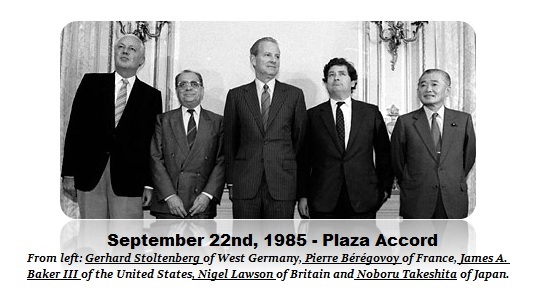 Even the Plaza Accord in 1985 was a deliberate attempt to lower the dollar and it was at that meeting when the USA argued that Europe needed to create a single currency to compete with the dollar. There is no competition with the dollar and that is the problem. The Fed wanted to raise interest rates back in 2014 but was lobbied by everyone not to. The Fed has lost control of the local economy because the domestic policy has been suppressed by international policy. The IMF, Europe, and emerging markets all pleaded with the Fed NOT to raise interest rates regardless of the domestic policy objectives. This is complete sophistry and the arguments of people who really have no clue about how the global economy functions. I have been in meetings in Washington where I have been asked how to PREVENT the dollar from being the reserve currency. The answer is simple. There is no law that the USA can pass to bring about such a result. It is coming. That will be the Monetary Crisis. But every such crisis has resulted in the dollar rising. That will bring the new monetary system. Not a lower dollar.